These days you can get just about anything by subscription, but now there's a business that's put a twist upon something that's always been available in this format, and what they offer makes for a great gift! 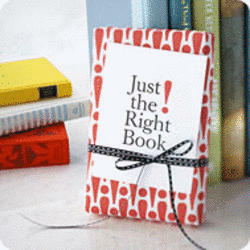 Just The Right Book is a subscription service that sends books, but specifically as gifts. The subscription terms can send out a book every month, every other month or once per quarter. When someone buys the subscription for a friend or family member they provide some basic information about the recipient, including whether he or she would like to read, children's, teen, or adult books. There's also the option to select whether paperbacks or hard cover books would be preferred (or a combination of both), as well as the reading level for children, and the genres they prefer. Of course, this does mean that you have to have some knowledge about the person you're giving a gift to, but that's part of what makes this such a great idea. Once the recipient receives their first book, however, they can provide more information about the books they'd like. The service also monitors reading habits to anticipate which books would be most appreciated! They can also select specific book titles or books by specific authors if they'd prefer! Just The Right Book will ship within the US or internationally, and the pricing is very reasonable for the quantity and quality of books that are selected!